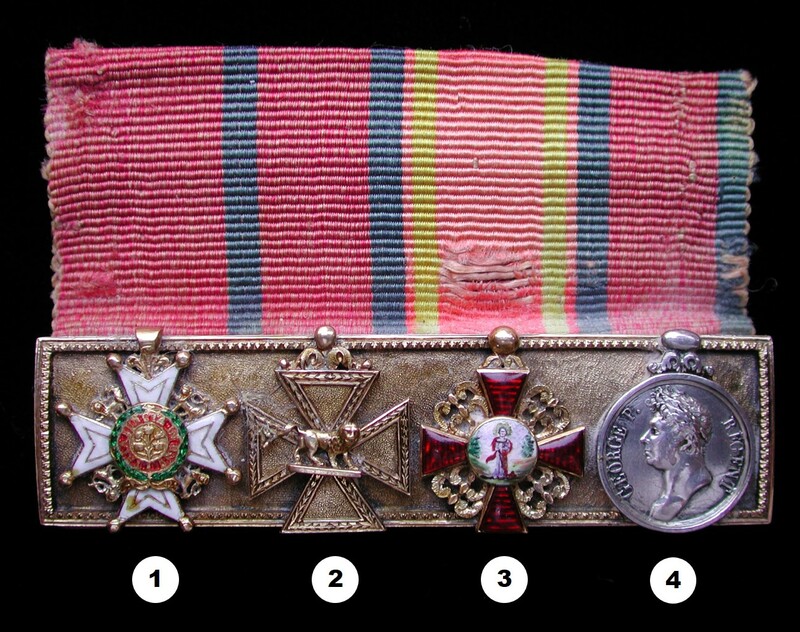 The Miniature Medals of Field Marshal Sir William Gomm, G.C.B. Miniature Medals were not made until 1815, at the close of the Waterloo Campaign. The earliest known date from that period. Officers caused them to be made for their wives to wear, and their use was tacitly allowed. The first reference to them in an official publication is to be found in the 1873 edition of the Queen’s Regulations, section 12, para. 6, which says Miniature Orders and Medals or ribands of Medals only, are to be worn by officers in undress uniform. Other notable medal numismatic authorities up to the early 20th century would also base their assumptions on Mayo’s publicized statements. I have also studied the provenance of early miniature orders and medals privately executed by jewelers for numerous recipients. Many were made sometime between 1815 and 1850, confirmed by the fact that many of the officers died between these dates. Field Marshal Sir William Maynard Gomm, G.C.B., a Peninsular War and Waterloo veteran, is shown in Figure 1 wearing his miniature medals mounted on a single bar on his left chest (2). Sir William’s miniature bar was made somewhere between 1815 and 1850. This assumption is based on his relative age and dress in the portrait, his wearing a Badge of a Knight Commander of the Bath (K.C.B) around his neck (promoted to a G.C.B. in 1859), as well as his miniature bar missing his Military General Service Medal issued to him in 1849. Figure 1 – Sir William Maynard Gomm K.C.B. wearing his Badge of a K.C.B. and his miniatures on his left breast. 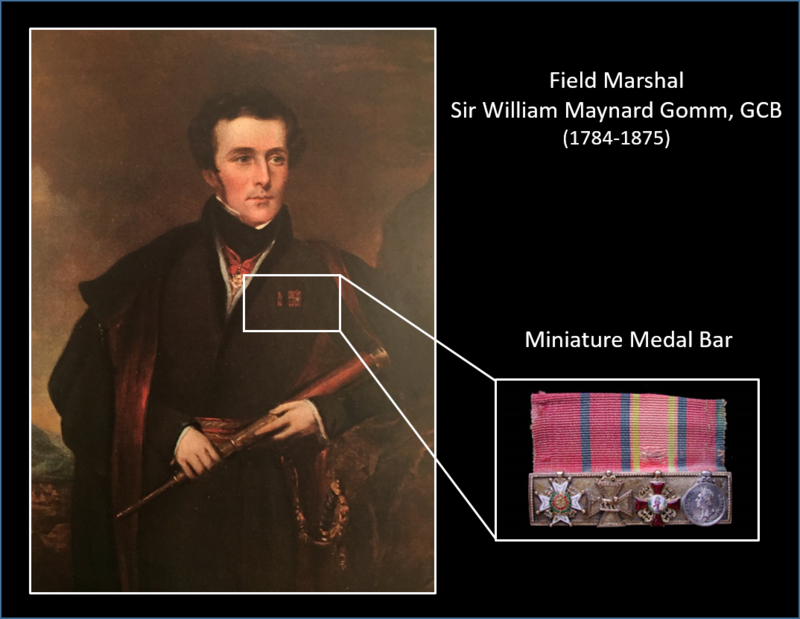 Figure 2 – The Napoleonic miniatures of Field Marshal Sir William Maynard Gomm, G.C.B. Image from Author’s archive. Army Gold Cross – Captain Gomm was promoted to Major in 1811 for his services in the Peninsula campaigns and elevated to Assistant Quartermaster General (AQG). The year 1812 would find Major Gomm engaged in the siege of Badajoz where he would earn a Small Army Gold Medal. He would continue in the capacity of AQG at Salamanca, Vittoria, Sebastian and Nive where he would earn an Army Gold Cross with one bar (five total actions). Knight Commander of the Bath (K.C.B.) – Lieutenant Colonel William Maynard Gomm would become one of the Duke of Wellington’s most trusted Staff Officers throughout the Peninsular War. His reward for such distinguished service would be promotion to Lieutenant Colonel in the Coldstream Guards and being knighted as a Knight Commander in the newly re-organized Order of the Bath on the 2nd of January, 1815. Russian Order of St. Anne, 2nd Class – Lt. Col. Sir William Maynard Gomm, K.C.B. would receive the Second Class Order of St. Anne for his services at Waterloo from the Emperor of Russia via a dispatch from the Duke of Wellington’s Headquarters dated October 8th, 1815.The following anecdote relates to a complement paid to Field Marshal Gomm by the Emperor of Russia in 1874 (3). Sir Charles Ellice sat next to me (Sir William) at dinner yesterday. I was pleased at the way he described to me the scene at the Duke of Cambridge’s table last May, of which, oddly enough, I had not heard any account, except from Sir William and Prince Teck; although the Duke of Cambridge told me how gratifying it was to him that it happened at his table. The Duke gave the Emperor of Russia’s health standing. The Emperor gave the Queen’s. He then stood up and proposed “The Peninsular hero present, the Field-Marshal.” All seem to have been taken by surprise, no one more than Sir William himself, who was seated between Prince Teck and Sir Charles Ellice. He did the right thing; in the most dignified and simple manner, he got up and bowed most gratefully to the Czar, and then to the Duke of Cambridge. Sir Charles Ellice spoke of it quite with emotion, and considered that everyone present felt gratified by the compliment to the oldest soldier in the army. The Emperor of Russia afterwards sent Sir William the Order of St. Vladimir, which, however, the rule of our service does not permit him to wear. He has the Order of St. Anne (also Russian), and Lord Derby offered to exchange, through the two governments, the Vladimir for the highest order or class (Grand Cross) of St. Anne, but Sir William said he would prefer to retain in its present form the St. Anne, which he received at Waterloo under peculiar circumstances, with a little band who are now no more, and to retain the Vladimir, though not permitted to wear it, as a personal complement form the present Czar. British Waterloo Medal – As Assistant Quartermaster General, Sir William’s responsibilities in the upcoming Waterloo campaign were arduous, as well as extremely dangerous. He was always at the front of the action executing his AQG duties and in his own words; “in the hottest of all this glorious business”. Sir William was heavily involved in the early preliminary battlefield maneuvering before the battle of Quatre Bras as he led the 28th Foot to occupy Gemioncourt, but found it already in French possession. He and the regiment retreated to Quatre Bras, where the 5th Division along with other elements of Wellington’s Army engaged the French forces in hostile action on June 16th 1815 as a pitched battle warm-up to Waterloo. Although he did not suffer, his horse was shot out from underneath him and once again his charmed luck would hold. Two days later on June 18, 1815, Sir William would be engaged with the 5th Division at the battle of Waterloo in a defensive struggle against the onslaught of Napoleon’s Army. It should be noted that although he was on staff as Assistant Quartermaster General, his own company from the Coldstream Guards was one of several companies of this regiment that heroically defended the farmhouse at Hougoumont and thus saved the battle from turning on Wellington. General Picton’s 5th Division would march out of Brussels to the battlefields of Quatre Bras and Waterloo with 5,270 officers and men. They were reduced to half of this number through both killed and wounded by the end of the campaign. Once again, Sir William would escape serious injury with his fortunate luck. His cherished horse “George” would suffer a wound after carrying him both at Quatre Bras and at Waterloo, but would live to retire in Stoke Park and be buried there at the ripe old age of 32. Sir William continued to unselfishly serve his country on active military duty for an astonishing 81 years, the longest continuous service in the history of the British Empire. During his life, he was the veteran of many of the bloodiest battles of the Napoleonic Wars, rose to Commander-in-Chief of India, earned the utmost respect from his peers and held some of the highest honors his beloved England could bestow on a military officer. Early Napoleonic miniatures is a fascinating yet not widely researched topic. More posts on Napoleonic miniatures will follow in the weeks and months ahead. In the meantime, I would be extremely interested in hearing from anyone that can shed more light on the subject of early miniature medals. Chris, this article is very interesting and beautifully written. I found it fascinating. Thank you for sharing this wonderful group and engaging story. Thanks Rick. Sir William Gomm’s story is a fascinating one. It is hard to comprehend 81 years of active service for his country, a record that will never be broken again in the history of the British Army.